A critical dissection of the post-War advertising world, The Hucksters blows hot and cold. The drama surrounding the business of marketing resonates with a satisfying edge. In comparison, the romance elements appear contrived and stagger into somewhat bedraggled predictability. In New York, wily advertising executive Victor Norman (Clark Gable) is looking to re-start his career after serving in the Second World War. He approaches Mr. Kimberly (Adolphe Menjou), head of the Kimberly Advertising Agency, to seek a position. Victor hangs around on a free-lance basis to help Kimberly deal with his most difficult client: Evan Evans (Sydney Greenstreet), the domineering and egotistical head of the Beautee Soap company. Evans gives Kimberly $10 million worth of business every year to make Beautee the best selling soap in America, and terrifies Kimberly's executives with impossible demands. Victor proves his ability by convincing widow Kay Dorrance (Deborah Kerr) to endorse Beautee soap, and the two become romantically involved. 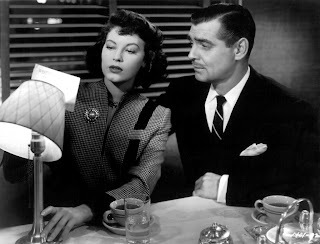 However, local lounge singer Jean Ogilvie (Ava Gardner) also has eyes for Victor. 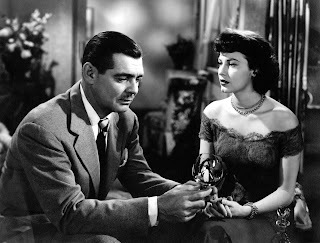 With clumsy missteps besetting the relationship between Victor and Kay and opening the door for Jean, Evans throws the next impossible demand Victor's way: secure the services of two-bit comedian Buddy Hare (Keenan Wynn) and turn him into a success on a radio show to be sponsored by Beautee soap. Victor has to deal with talent agent David Lash (Edward Arnold), please Kimberly, satisfy Evans, secure a job, and choose the right woman for his future. The Hucksters is based on the best-selling (and at the time sensational) book by Frederic Wakeman, Sr., and some elements do not translate well to the screen. Victor's attempted courtship of Kay at a sleazy motel burns too much time and smacks of incompetence totally at odds with his character, while a pivotal conversation between Victor and talent agent David Lash is inserted without context and as a result catastrophically fumbled. Clark Gable, 20 years older than Kerr and 21 ahead of Gardner, is hazily unconvincing as the romantic lead, but moves comfortably through the minefields of the corporate world, creating in Victor Norman a believable executive oozing confidence and quick to enact solutions to problems that others find intractable. The Hucksters was Deborah Kerr's debut in Hollywood, and although competent, she is not the best thing in the movie. Her friendly but conservative character of Mrs. Dorrance has absolutely nothing in common with the slick and resourceful Victor Norman, and there is simply no reason for the two of them to fall in love, leaving Kerr in an awkward lurch as the leading woman who must fall for the leading man due to convention rather than conviction. In contrast, the lively Ava Gardner as Jean Ogilvie positively sparkles, and Jean's earthy talents appear to be the perfect fit for Victor. Both actresses would go on to become major stars, Kerr by careful design and Gardner through the happy discovery of her performance in The Hucksters. Director Jack Conway steers the movie to its best moments in the scenes focusing on Victor's interactions with Kimberly and Evans. Sydney Greenstreet steals every scene he is in with overwhelming presence. His portrayal of the insufferable tycoon Evans is a treasure, surrounded by yes men and yes women and outwardly demanding their immediate agreement with all his opinions. The dynamics between Evans, Norman and Kimberly are at the heart of the movie, filled with fascinating lessons in personal and corporate leadership as well as examples of human behaviour under pressure. In a movie packing mixed content, the business drama is a sharp deal, but the romantic triangle needs to be liquidated at a discount.